Five years later, after much hard work and many permits, Corayer was an oyster farmer. His first batch of fresh, salty, Block Island raised Eastern oysters (nicknamed Block Island Beauties by the New York Times) made their debut to much acclaim at the 1999 Old Ebbitt Grill Oyster Riot, an annual event in Washington, D.C. That was the jump-start Corayer needed, and now his oysters are served in fine restaurants around the country, from San Francisco to New York. “The water in Great Salt Pond (where my farm is) is the cleanest in Rhode Island,” Corayer notes, “And my oysters have a very high salinity level.” Based on his initial success, Corayer has expanded Block Island Shellfish Farm. He now has 400,000 oysters and clams growing with the assistance of his latest addition—a solar-powered water pump (the only one like it in the U.S.) that speeds water flow over the oyster beds. 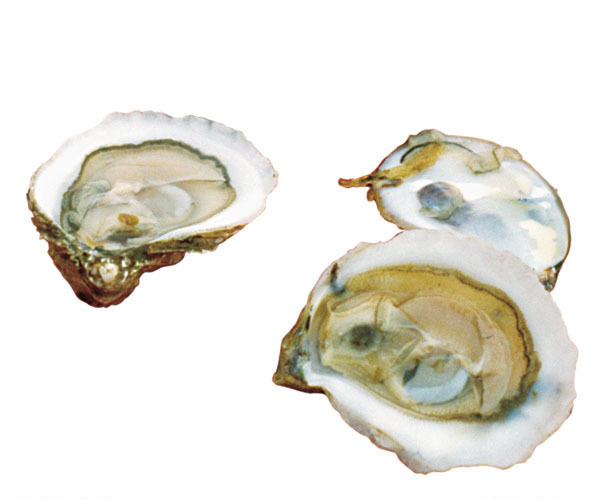 This should shorten the time an oyster grows to market size (3 inches) from three years to two. Block Island oysters start life as “seeds” the size of a thumbnail; they grow to about 1-1/2 inches in their first year and to about 2 inches in their second—if one of their enemies (from tiny crabs to starfish) doesn’t get them first. The oysters need food, shelter, and protection, just like any other farm animal. Mesh bags protect the oysters from most hungry predators; as they grow, Corayer transfers them to larger-meshed bags. The bags tuck into large cages (marked by buoys to alert sailors and kayakers) that rest on the sandy bottom the oysters love. The tidal movement through the four-acre farm keeps the oysters feasting on the plankton-rich tides of the Atlantic. To look their best, Block Island oysters get a scrub two or three times during their growth. When they’re ready for market, they look much spiffier than a wild oyster.